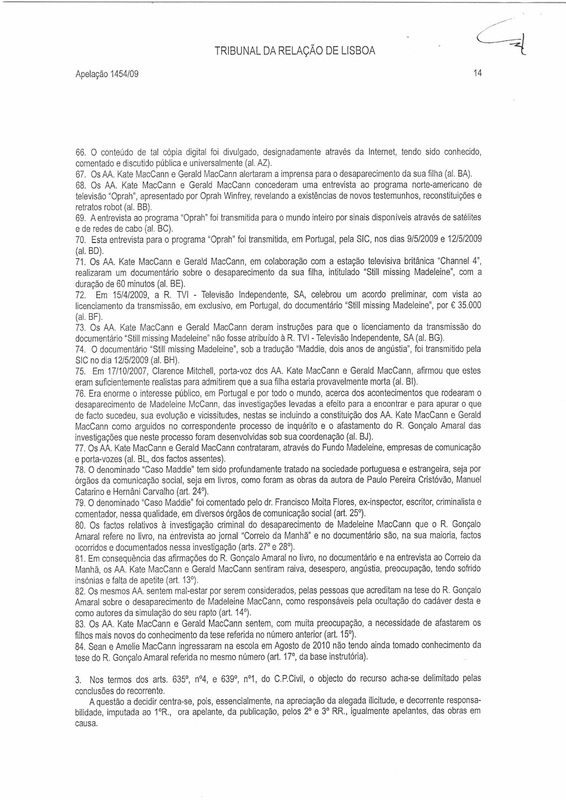 Kate, Gerald, Madeleine, Sean and Amelie McCann ― the last three minors represented by the first claimants, their parents ― filed, against Gonçalo Amaral, the publisher Guerra e Paz, the audiovisual company Valentim de Carvalho and TVI, legal actions in the ordinary form, subsequently attached to Lisbon 1st Civil Chamber, demanding the condemnation of the first defendant to pay the claimants the total amount of €1.200.000, plus interest at the legal rate since the summons, as compensation for moral damages arising from the publication by the first defendant, in book and DVD, of his version of the facts related to the disappearance of the minor MMC, third claimant, and the prohibition for sale, publication or disclosure by all defendants, book and DVD in question. All defendants challenged, rejecting the responsibility imputed to them and concluding that the action was inadmissible. 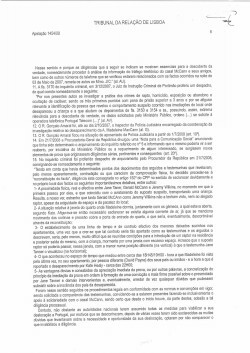 The sentence uttered following the judgement held that the action was admissible in part, sentencing the first defendant to pay to each of the first two claimants the amount of €250.000, plus legal interest, and prohibiting the first three defendants to proceed with existing sales and any new editions of the book and DVD as well as transferring the associated copyrights, absolving the defendants of other queries of the claimants and the fourth defendant of all queries. 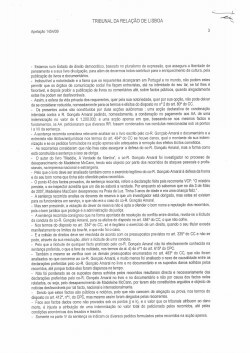 - The book, documentary and interview involved in the autos have as main motivation the defence of Gonçalo Amaral's personal and professional honour. - The writing and publication of the book, as the documentary and the interview mentioned, were carried out under rights constitutionally guaranteed by the ECHR (European Convention on Human Rights) and the Portuguese Republic Constitution, accurately in articles 37 (1) and 38 (2) . - These rights can in no way be ousted by invoking a special reserve requirement affecting the appellant on the ground that he was inspector of the judicial police, as it appears in the first instance decision.
. neither their privacy, such as articles 80 (3) and 81 (4) of the CC (Civil Code) define it and describe its effects, insofar as they themselves voluntarily limited / alienated such right by multiplying interviews and interventions in the media organs.
. nor, in the same way, their image and reputation, as they themselves placed the matter in the public area and gave it a worldwide celebrity, opening the doors to all opinions, even opposing views.
. nor, furthermore, all the guarantees of a criminal procedure, namely a fair investigation and the right to liberty and safety (5), as the respective contents of the book, documentary and interview describe the facts included in the investigation. 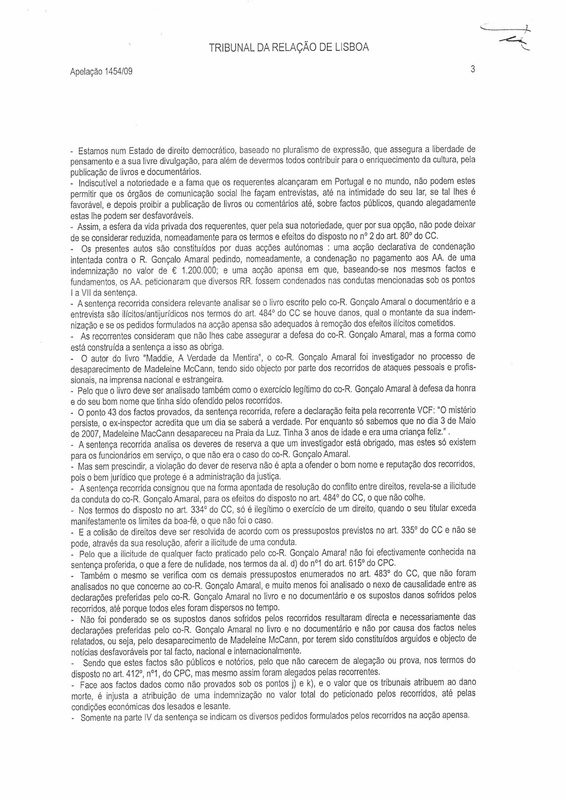 - These facts, moreover, were made ​​available to the general public by the Public Prosecutor, who ordered the making of a digital copy of the police investigation files, except for documents that cannot be turned over to the public, and the delivery of a copy to those who had requested it, as journalists. - The fact that the content of the digital copy was disclosed on the Web, making it universally the subject of comment and public discussions, must be taken into account. - Therefore no reserve duty can be imposed on the defendant about facts that have been disclosed and made public, particularly the whole investigation process. - Once the duty of reserve is non-existent, freedom of expression of the defendant comes first and prevails over the rights asserted by the claimants, as the sentence has observed before introducing the unusual duty of reserve. 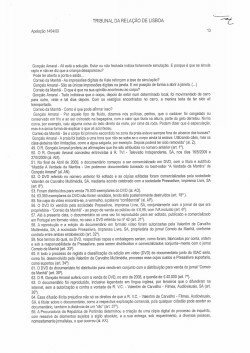 - The act of the defendant in question is not unlawful under the terms and effects of article 483 of the CC (Portuguese Civil Code) (6), and he can not be ordered to pay any compensation whatsoever, and must be completely absolved of the request made by the claimants. - No less should he be prohibited to publish, sell and disclose the book and the DVD mentioned. - It should be noted that, in the words of the same standard, besides the absence of illicit items, would have to found the civil compensation request, provide evidence of a causal link between the defendant's conduct and damage allegedly suffered by the claimants, which, if we refer to the answers given in articles 11 to 16 of the instruction's basis, as well as to respective motivations, is totally excluded. It has still to be taken into account the fact that the statements contained in these articles are more like conclusions and not like facts to be included in the basic education. - These conclusions are not based on any factual element either present in the instruction's basis or reported in the claimants' exposure. - If however, reductio ad absurdum, one would have considered as such (effective damages and deserving protection, caused somehow by the book and the DVD) the alleged contents of articles 13 to 15 of the instruction's basis - nothing else was presented as proven damage – one would say they are not true. - To appreciate this falsehood, and to the extent that the appellant here (GA) meant that such "facts" should be overturned, it will be enough to re-evaluate the recorded testimonies of Michael Terence Wright, Alan Robert Pike and Angus Keith McBride. 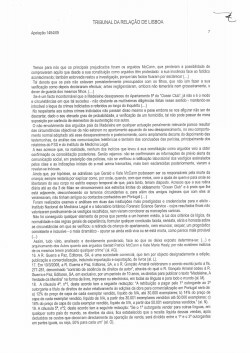 - These statements show that, before the publication of the book and documentary in question and in the claimants' full knowledge, theories and arguments identical to those of the defendant circulated publicly, mainly on the Web. - Therefore, and whilst were true the feelings given as proven in the factual matter here at stake, whether of rage, despair, anxiety, unrest or worry, particularly concerning what the (MC) children might be led to believe, the truth is that the reason for all this existed before any intervention on the part of the defendant, here appellant. - The same can be said with regard to insomnia and lack of appetite. - The Court must take into account the fact that those witnesses are close to the claimants (family member, psychologist and lawyer) and that, notoriously, they always end up their statements by trying to underestimate the theses anterior to the book and documentary and, of course, to overemphasize the impact of the latter on the mindset of the claimants. - Particularly in the case of the witness M.T. Wright, who was assigned to support the claimants after the disappearance of the minor MMC, in the promotion of awareness campaigns and monitoring of certain sites and information conveyed by the web. - The witness who, as part of the summary and critical analysis of key witness testimony was discredited by the Court (and rightly so) for consulting handwritten notes including, in order and in an almost perfect chronological sequence, topical replies to questions put to him during the final hearing. - But the statements of this witness, when he admits, obviously upset, that long before the publication of the book and the documentary, theses opposed to the MC were circulating - against the defendant / appellant - deserve, on the contrary, special consideration. "Art 13 ° -. 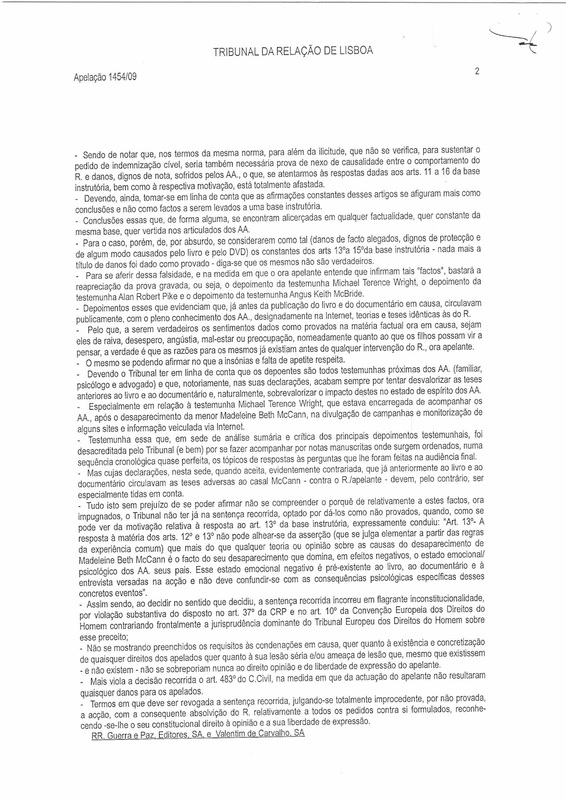 The response to the content of Articles 12 and 13 can not dispense with the assertion (judged elementary according to rules of common experience) that, more than any theory or opinion on the causes of the disappearance of MMC, the fact of her disappearance dominates, with negative effects on the emotional / psychological state of the claimants, her parents. This negative emotional state is pre-existent to the book, the documentary and the interview mentioned in the lawsuit and should not be mixed up with the psychological consequences specific to these concrete events. " 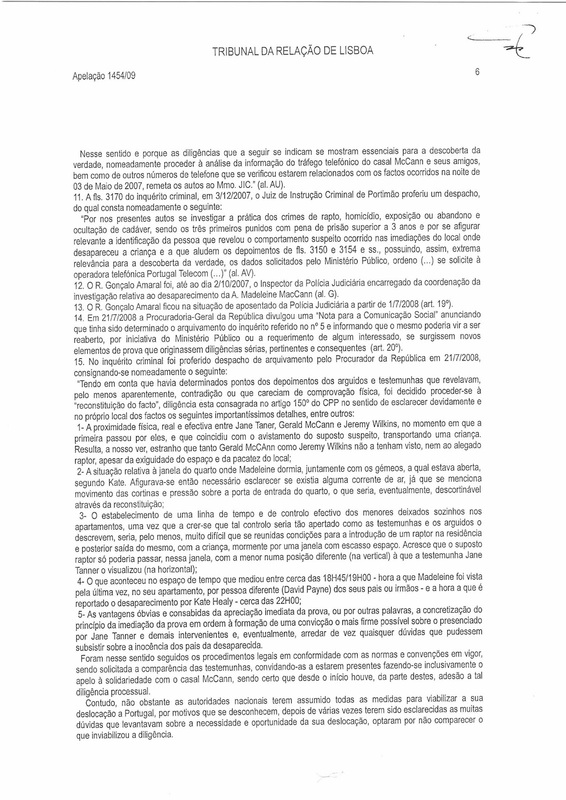 - Therefore, by deciding in the sense that it decided, the appealed sentence ran the risk of flagrant unconstitutionality by substantial violation of article 37 of the CRP (Constitution of the Portuguese Republic) (1) and article 10 of the ECHR (European Convention on Human Rights) (7), frontally counteracting the prevailing jurisprudence of the European Court of Human Rights in this area. - The conditions are not met for the condemnation at stake neither as to the existence and the application of any right of the claimants, nor for serious prejudices and/or threat of prejudices, even if (those conditions) existed - and they do not exist – they never could outweigh the right to opinion and freedom of expression of the defendant. - In addition, the appealed sentence violates the article 483 of the CC (6), insofar as no evidence of damage to the claimants resulted from the acts of the appellant (GA). - It follows that the sentence on appeal must be broken, being deemed totally unjustified to the extent that the action is not proven, with the consequent release of the defendant in relation to all the demands made against him and recognizing him the constitutional right to opinion and freedom of expression. - We live in a democratic State of Law, based on pluralism of expression, which guarantees freedom of thought and free disclosure, besides the fact that we must all contribute to the enrichment of culture through the publication of books and documentaries. 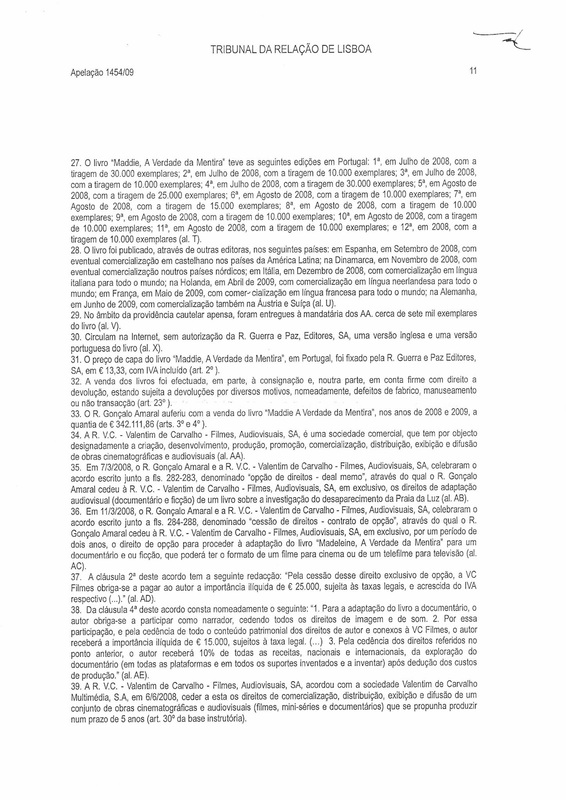 - As it is undisputed that the claimants have achieved notoriety and fame in Portugal and around the world, it is not possible that they grant interviews to the media, even in the intimacy of their home, when it is favourable, and then forbid the publication of books or comments, even on publicly known facts, when they feel those might be unfavourable. - Thus the sphere of private life of the claimants, as much through their notoriety as through their option, can only be considered reduced, especially according to the terms and effects of the contents of Article 80-2 of the CC (3). 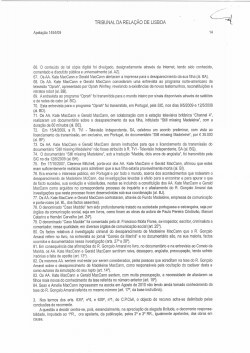 - The current autos are made up of two autonomous actions: a declarative condemnation action brought against the defendant GA, asking, in particular, that he'd be ordered to pay the applicants compensation in the amount of 1.200.000 euros; and an appendix action in which, based on the same facts and grounds, the applicants requested that various defendants would be condemned in respect of the behaviour mentioned in points 1 to VII of the sentence. - The appealed sentence considers it relevant to analyse whether the book written by the co-defendant GA, documentary and interview are illegal / anti-juridical under the terms of article 484 of the CC (8), whether there is damage, what is the amount of compensation and whether the claims made in the appendix lawsuit are adequate to the withdrawal of the committed illicit effects. - The appellants consider that it does not belong to them to defend the co-defendant GA, but the way the sentence is constructed obliges them to. - The author of the book Maddie, the Truth of the Lie, co-defendant GA, was investigator in the criminal investigation into the disappearance of MMC, having been the object of personal and professional attacks by the claimants, in the national and in the foreign press. - It follows that the book should be analysed as a legitimate exercise of the co-defendant GA in defence of his honour and reputation undermined by the claimants. 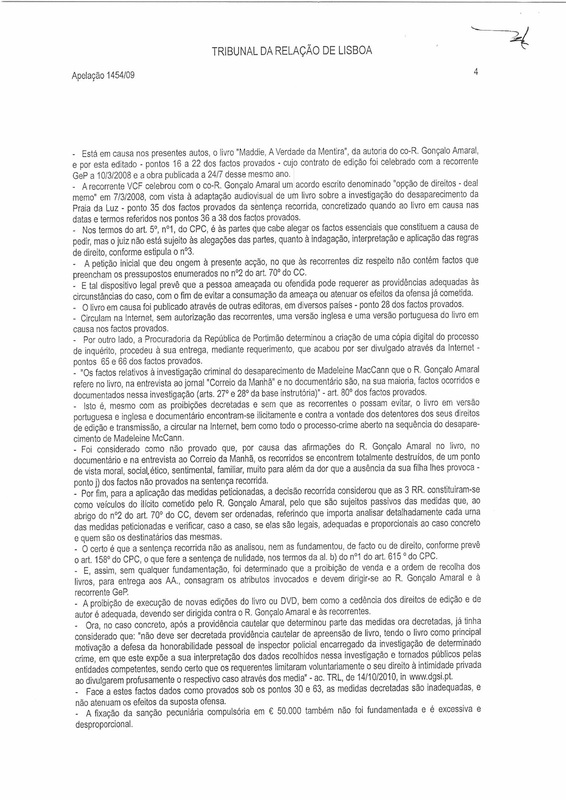 - Point 43 of the proven facts, in the appealed sentence, refers to a statement of the appellant VCF (Valentim de Carvalho Filmes): The mystery continues, the former inspector thinks that one day the truth will be known. Meanwhile we only know that on 3 May 2007 MMC has disappeared in Praia da Luz. She was 3 years old and was a happy child. - The appealed sentence analyses the duties of reserve required from a police officer, but these duties only apply to serving officers, which was not the case for co-defendant GA.
- However, without disregard, breach of the duty of confidentiality is not capable of offending the reputation of claimants, because the juridical power that protects them is the administration of justice. - The appealed decision has documented that the illegality of the co-defendant GA's conduct is revealed in the kind of resolution of the indicated conflict between rights, according to the effects of article 484 of the CC (8), which is not surprising. - Under article 334 of the CC (9), the exercise of a right is only illegitimate when the holder manifestly exceeds the bounds of good-faith, which was not the case. - The collision of rights must be resolved in accordance with the assumptions provided in article 335 of the CC (10) and cannot, through its resolution, assess the illegitimacy of a conduct. - It follows that the appealed sentence does not actually mention any illicit fact practised by the co-defendant GA, which turns it null, under article 615-1-d) of the CPC (Civil Procedure Code) (11). - The same can be said of the remaining assumptions, listed in article 483 of the CC (6), which have not been analysed regarding the co-defendant GA, when even less analysed was the causal link between the statements of the co-defendant GA in the book and the documentary and the damage that the applicants are deemed to have suffered, since all were dispersed in time. 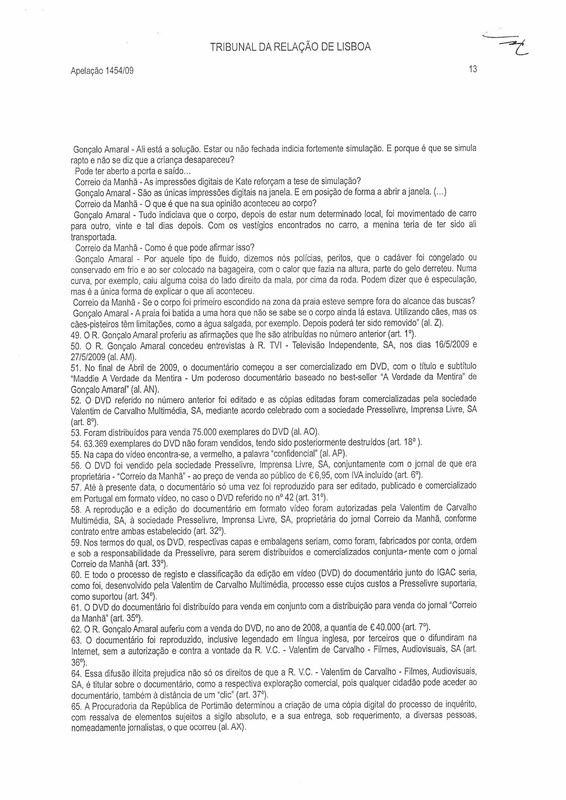 - It was not evaluated if the damage that the applicants are supposed to have suffered results directly and necessarily from the statements of the co-defendant GA in the book and the documentary and not from the facts stated therein, i.e the disappearance of MMC, the constitution of her parents as official suspects (arguidos) and their being the subject of negative news for that reason, nationally and internationally. - These facts being public and notorious, they don't lack argument or proof, under the terms of article 412-1 of the CPC (12), but even so they were alleged by the applicants. - Facing the facts given as unproven on j) and k) and the value that the courts attribute to the death damage, it is unfair to award compensation of the value requested by the applicants, be it from the point of view of the economic situation of the injured party and the injuring one. - Only in the fourth part of the award are listed the various requests made by the claimants in the appendix action. - At stake in the present autos is the book Maddie, the Truth of the Lie written by the co-defendant GA and published by the appellant Guerra & Paz - points 16-22 proven facts. The publishing contract was celebrated with the appellant GA on 10/3/2008, the book being published on the 24/7 of the same year. - The appellant VCF celebrated with the co-defendant GA a written agreement, referred to as "rights option - deal memo", on 7/3/2008, for the audiovisual adaptation of a book about the investigation on the disappearance of MMC in PDL - point 35 of the proven facts of the sentence on appeal, embodied in the terms and dates mentioned in paragraphs 36 to 38 of the proven facts. - The initial application that gave rise to the present action in respect of the appellants, does not contain facts that meet the assumptions listed in article 70-2 of the CC (14). - Such a legal framework provides that the threatened or offended person may require appropriate measures to the circumstances of the case, to avoid the execution of the threat or mitigate the effects of the offence already committed. - The book in question was published by other publishers in various countries - point 28 of the proven facts. 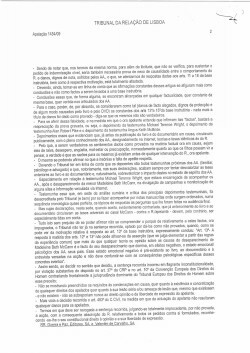 - Among the proven facts, an English and a Portuguese versions of the book circulate on the Web, without the authorisation of the appellants. 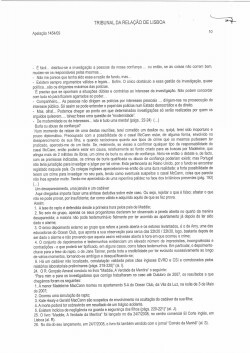 - On the other hand, the Portimão Public Prosecutor commissioned a digital copy of the investigation file and handed it out upon request, which ended up being disclosed on the Web - points 65 and 66 proven facts. 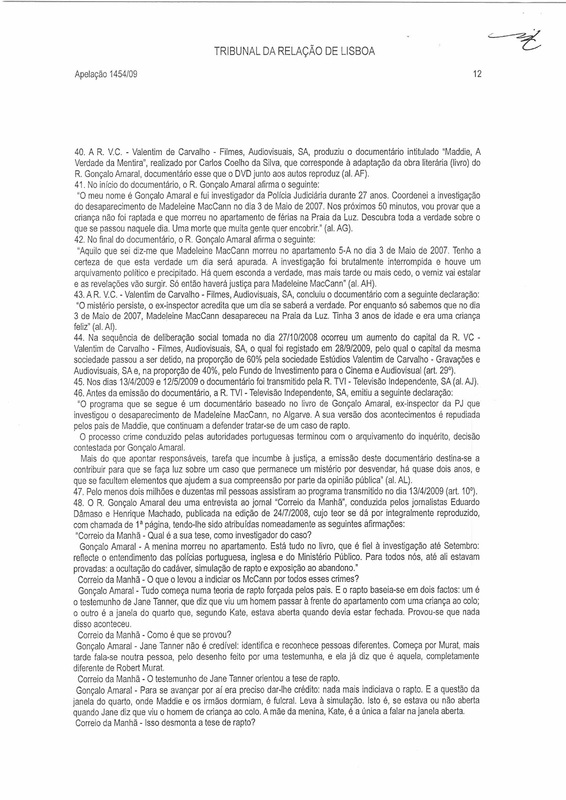 - The facts relating to the criminal investigation into the disappearance of MMC to which GA refers in the book, in the interview for the newspaper Correio da Manha and in the documentary are, mostly, the facts that occurred and are documented in the investigation (articles 27 and 28 of the instruction basis) - article 80 of the proven facts. 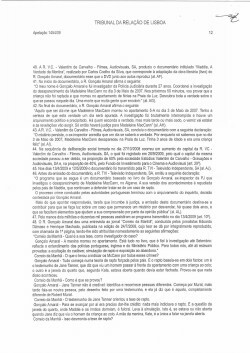 -In other words, despite the bans issued and without the appellants’ ability to avoid it, the book in Portuguese and English versions, as with the documentary, circulate on the Web illegally and against the will of the holders of copy and transmission rights, as well as every record of the criminal investigation into the disappearance of MMC..
- It was considered not proven that, due to the defendant GA's assertions in the book, documentary and interview with Correio da Manha, the claimants are completely destroyed from moral, social, ethical, sentimental, family points of view, far beyond the pain caused by the absence of their daughter - point j) of unproven facts in the appealed sentence. - Finally, for the purposes of the requested measures, the appealed sentence held that the three defendants functioned as vehicles of the illicit act committed by the defendant GA, so they were passive subjects of measures which, under article 70-2 of the CC (14), must be ordered, indicating that it is important to analyse in detail each of these responses and checking, case by case, if they are legal, appropriate and proportionate to the actual case and to find out who are the recipients. - What is sure is that the appealed sentence has not analysed them nor given them a basis in fact or law, in accordance with the provisions of article 158 of the CPC (15), which turns the sentence null under the terms of article 615-1b) of the CPC (11). - And so, without any foundation, it was determined that the prohibition of sale and the order of collecting the books to be handed to the claimants embody the cited attributes and should be addressed to the defendants GA and Guerra & Paz. - The ban on new editions of the book or the DVD, such as the cession of publishing and copy rights is adequate and must be addressed to GA and the defendants. - Faced with these facts given as proven in paragraphs 30 and 63, the measures enacted are inadequate and do not attenuate the effects of the alleged offence. - Establishing the obligatory financial penalty to €50.000 is also without foundation and is excessive and disproportionate. - The judgement is suffering from nullity under the scope of paragraphs b) and d) of art. 615-1 of the CPC (11) and should be revoked, appellants to be acquitted of measures decreed, with all the legal consequences. Counter-alleging , the respondents decided on confirming the first instance judgement. Gathered legal visas, decision is required. 1. The applicants Gerald McCann and Kate are married to each other (al.A). 2. The applicant Madeleine McCann was born on 12.5.2003 , daughter of KMC and GMC (al.B). 3. The applicant Sean McCann was born on 1/2/2005, son of KMC and GMC (al.C). 4. The applicant Amelie McCann was born on 1/2/2005 , daughter of KMC and GMC (al.D). 5. The applicant MMC has been missing since 3/5/2007 , resulting in the criminal investigation No. 201 / 07.0GALGS, opened by the prosecutor of Portimao (al.E). 6. The dogs Eddie and Keela, from the British police, have detected human blood and cadaver scent in the apartment 5A of the Ocean Club (al.AR). 7. The dogs Eddie and Keela, from the British police, have detected human blood and cadaver scent in the vehicle rented by the applicants KMC and GMC after Madeleine's disappearance (al.AS). 8. The applicants KMC and GMC were constituted (by lawyer) assisted witnesses (arguidos) in the criminal investigation (al.F). 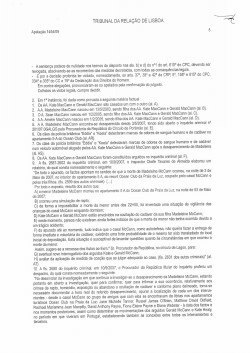 F) Given what has been confirmed so far, everything indicates that the couple McCann, as self-defence, does not want to deliver immediately and voluntarily the body, existing a high probability that the same was removed from the place where it was originally disposed of. This situation is likely to raise questions about the circumstances in which occurred the death of the minor. H) Evaluate the adequate measure of constraint to be applied in the case (page 2601)" (al.AT). "During the investigation which goes on regarding the disappearance of Madeleine McCann, the proceedings being therefore open either to confirm or to deny that the occurrence of the disappearance is related to the crimes of kidnapping, homicide, exposure or abandonment and concealment of corpse, and in accordance with the established plan, the need was felt to gather information on the actual time of the disappearance, verify the location of each stakeholder – from the McCann couple to the group of friends with whom they were on holiday in tourist apartments in the Praia da Luz Ocean Club, i.e Michelle Jane Tanner, Russell James O'Brien, David Matthew Oldfield, Rachael Jean Mampilly David Anthony Payne, Fiona Elaine Payne and Diana Webster – when the events occurred and in the moments that followed, and determine the movements of the assisted witnesses, Gerald McCann and Kate Healy, during their stay in Portugal, while also establishing connections between all stakeholders and third parties. 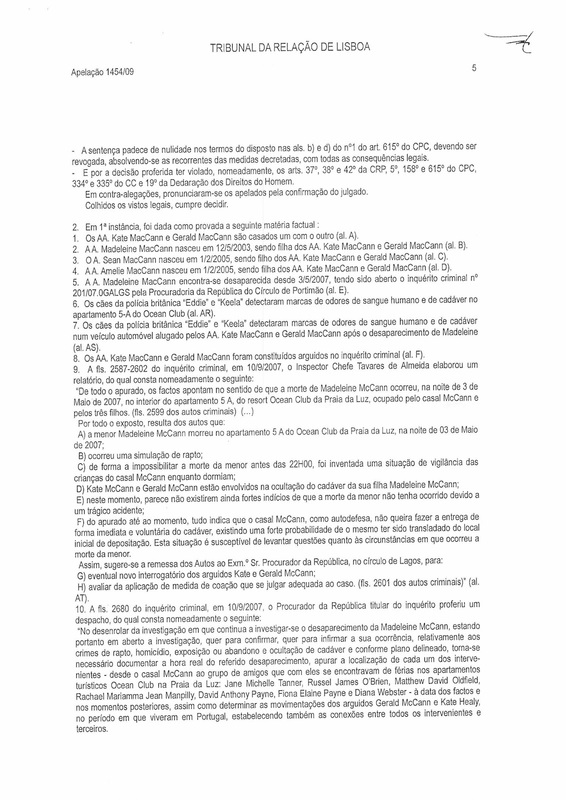 In this sense , and because the following investigation needed is essential for the discovery of truth , especially the analysis of information on telephone exchanges between the McCann couple and their friends, and other phone numbers, which have shown to be related to events of May 3rd 2007 evening, the autos are delivered to the Judge of Criminal Investigation (al.AU)." "Since the investigation, in these autos, concerns the practice of kidnapping, homicide, exposure or abandonment and concealment of corpse, the first three crimes being punished with a sentence of more than 3 years imprisonment, and since it seems convenient to identify the person who exhibited suspicious behaviour in the vicinity of the place where the child disappeared from, as mentioned in statements from pages 3150 and 3154 sq, the data requested by the public prosecutor being thus very important to discover the truth, I order (...) the soliciting telecommunications operator Portugal Telecom (...)" (al.AU). - 12. The defendant Gonçalo Amaral was, until 2/10/2007, the PJ inspector in charge of coordinating the investigation into the disappearance of the applicant Madeleine MC (al.G). - 13. The defendant GA is retired from the PJ since 1/7/2008 (art.19). - 14. 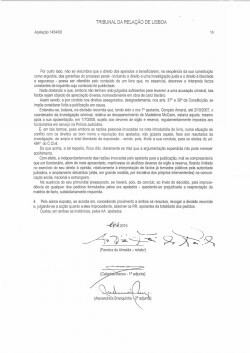 On 21/7/2008, the General Prosecution of the Republic informed through a "note for social communication" that the investigation mentioned in 5. would be shelved and could be reopened at the instigation of the Public prosecutor or at the request of any interested party, if new evidence arose, raising serious, relevant and consistent investigation (art. 20). 1) The physical, real and effective proximity between Jane Tanner, Gerald McCann and Jeremy Wilkins, at the moment when the first person walked by them, and which coincided with the sighting of the supposed suspect, carrying a child. From our perspective it is strange that neither Gerald McCann nor Jeremy Wilkins saw her, or the alleged abductor, despite the exiguity of the space and the tranquillity of the area. 2. The situation concerning the window to the bedroom where Madeleine slept, together with the twins, which was open, according to Kate. It has seemed necessary to clarify if there was a draught, since movement of the curtains and pressure under the bedroom door are mentioned, which, eventually, could be verified through the reconstitution. 3. The establishment of a timeline and of a line of effective checking on the minors that were left alone in the apartments, given that, if it is believed that such checking was as tight as the witnesses and the assisted witnesses describe it, it would be, at least, very difficult to reunite conditions for the introduction of an abductor in the residence and the posterior exit of said abductor with a child, particularly through a reduced width window. It is added that the supposed abductor could only pass, through that window, holding the minor in a different position (vertical) from the one that witness JANE TANNER saw (horizontal). 4. What happened during the time lapse between approximately 6.45/7 p.m. - the time at which Madeleine was seen for the last time in the apartment by a different person (David Payne) from her parents or siblings - and the time at which the disappearance is reported by Kate Healy - at around 10 p.m.
5. The immediate appreciation of evidence, or in other words, the fulfilment of the principle of contiguity of evidence offers obvious and well known advantages to form a conviction, as firm as possible, about what was seen by Jane Tanner and the other interposers, and, eventually, to dismiss once and for all any doubts that may subsist concerning the innocence of the missing child's parents. 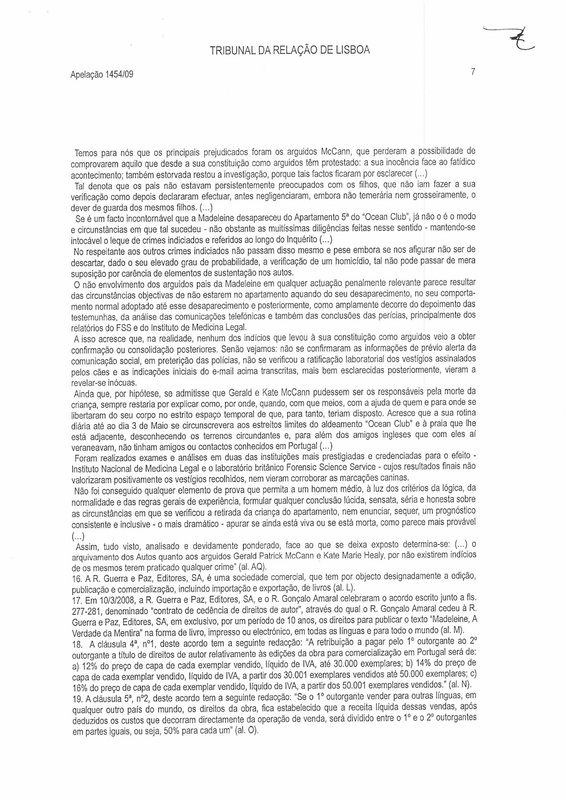 To achieve this according to the standards and conventions in force, legal procedures were instituted and the presence of the witnesses was requested, inviting them to participate, also appealing to solidarity with the McCann couple, as it is certain that since the beginning they adhered to that process diligence. Nevertheless, despite national authorities assuming all measures to render their trip to Portugal viable, for unknown reasons, after the many doubts that they raised about the necessity and opportunity of their trip were clarified several times, witnesses chose not to attend, which made the reconstitution impractical. 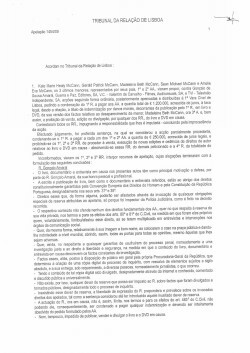 We believe that the main damage was caused to the McCann, who lost the possibility to prove what they have protested since they were constituted arguidos (by lawyer assisted witnesses) : their innocence in relation to the fateful event. The investigation was also disturbed, because said facts remained without clarification (...). Concerning the other surmised crimes (21), they are no more than that and in spite of our perception that, due to its high degree of probability, the occurrence of a homicide cannot be discarded, such cannot be more than a mere supposition, due to the lack of supporting elements in the files. It appears that the non involvement of the parents, assisted witnesses, in any penally relevant action stems from the objective circumstances of them not being inside the apartment when Madeleine disappeared, from the normal behaviour that they displayed until said disappearance and afterwards, as can be amply concluded from witness statements, from the telephone communications analysis and also from the forensics' conclusions, namely the reports from the FSS and from the National Institute for Legal Medicine. To this should be added that in fact none of the clues that led to their constitution as assisted witnesses was later confirmed or consolidated. Let's judge it: the information concerning a previous alert of the media before the police was not confirmed, the residues that were marked by the dogs were not corroborated in laboratory, and the initial indications from the above transcribed email (22), better examined afterwards, that ended up appearing to be inconclusive. Tests and analyses were performed in two of the most prestigious and credentialed institutions - the National Institute for Legal Medicine and the British laboratory Forensic Science Service -, their final results having neither positively evaluated the collected residues nor corroborated the dogs' alerts. - 16. The defendant Guerra & Paz SA is a commercial company whose objective is namely editing, publishing and trading books, import and export included (al.L). - 17. 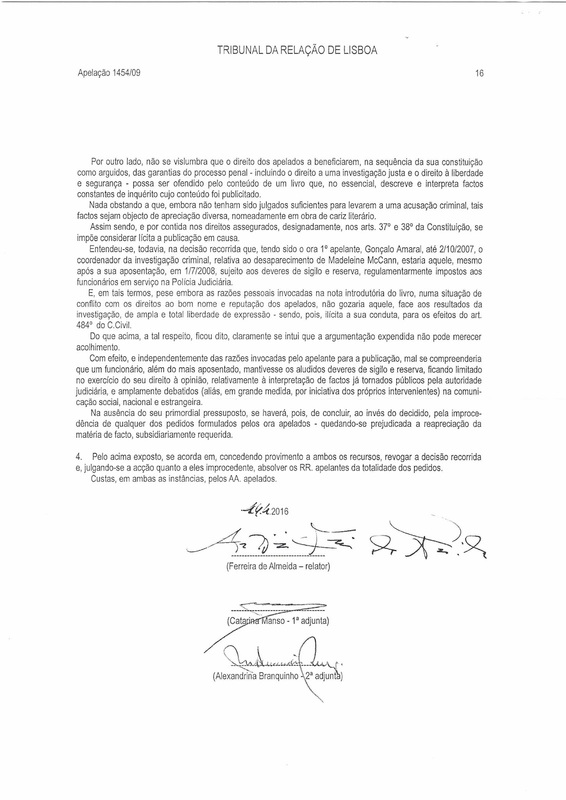 On 10/03/2008, defendants G&P Editors and Gonçalo Amaral celebrated a written agreement (attached at pp. 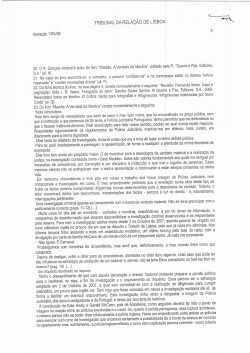 277-281), referred to as "copyright transfer contract", in terms of which the defendant GA yields to defendant G&P for a period of ten years, the exclusivity of copyrights of the book Maddie - a Verdade da Mentira in printed or electronic form, in any language ​​and in the whole world (al.M). c) 16% of the selling price for each copy sold (VAT excluded) from 50.001 on" ( Al.N) .
" If the first contractor sells the copy rights of the book in other languages ​​in any country, the liquid income of this sale, net of costs directly related to the sale transaction, will be shared between the first and second contractors in equal parts, i.e 50% for each "( al.O ). 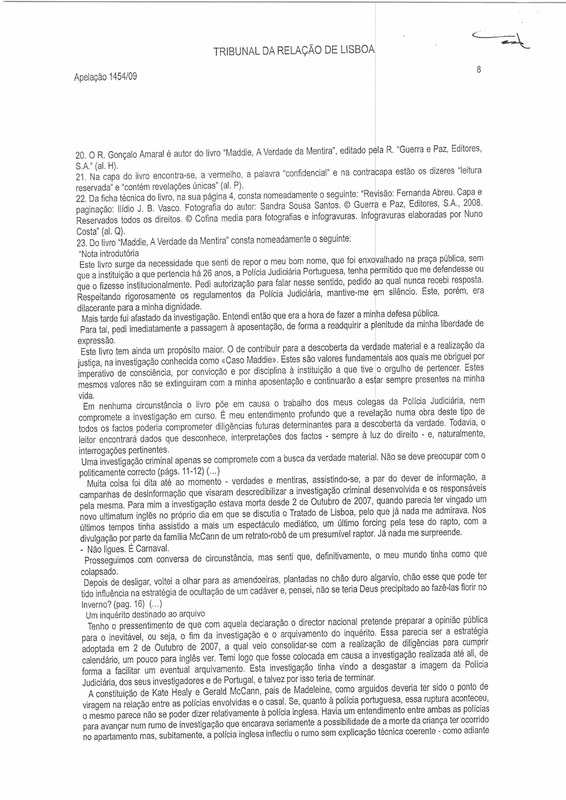 This book is rooted in the need I felt to restore my reputation, which has been undermined in the public arena, without the institution to which I have belonged for 26 years, the Portuguese Judicial Police, allowing me to defend myself or to do it institutionally. I asked permission to speak in this sense, that request remained unanswered. I strictly followed the rules of the PJ and I kept silent. This, however, lacerated my dignity. Later I was removed from the investigation. I realised then that the time had come to defend myself publicly. To achieve this, I immediately asked an early retirement, in order to regain the fullness of my freedom of expression. This book has yet another major objective. That of contributing to the discovery of material truth so that justice is done in an investigation known as The Maddie Case. These are the fundamental values to which I subscribed by imperative of conscience, conviction and discipline regarding the institution to which I was proud to belong. My retirement will not extinguish these values, they'll go on being present in my life. This book does not question the work of my colleagues in the police or compromise the ongoing investigation. It is my profound understanding that revealing all the facts, in this type of work, could jeopardise future operations, critical for the discovery of the truth. However, readers will discover data that they ignore, interpretations of facts - always in the light of law - and, of course, relevant questions. We were told many things so far - truths and lies - and there was, apart from the duty to provide information, disinformation campaigns aimed at discrediting the criminal investigation in development and those who were responsible for it. For me the investigation ceased to exist on October 2, 2007, when it appeared to have outweighed a new English ultimatum on the day of the summit on the Lisbon Treaty, so nothing surprised me more. The previous day I had attended an nth media spectacle, the ultimate forcing to the thesis of the kidnapping with the disclosure by the McCann family of a sketch of a suspected abductor. Nothing surprises me anymore. - Do not pay attention. It's carnival. We continued our convenient conversation, but I felt that my world had like collapsed for good. I have a feeling that with this statement, the national director intends to prepare the public opinion for the inevitable, i.e for the end of the investigation and the shelving of the case. That seemed to be the strategy adopted on 2 October 2007, which was consolidated with the execution of tasks to fulfil the calendar, a bit "for the English see" (23) I feared immediately for the present investigation to be questioned so as to facilitate a possible shelving. This investigation had come to undermine the image of the PJ, its inspectors and Portugal, and that's why perhaps it had to be discontinued. The constitution of Kate Healy and Gerald McCann, Madeleine's parents, as arguidos (by lawyer assisted witnesses) should have marked a turnaround in the relationship among the police forces and the couple. If, on the Portuguese police side, the break occurred, it seems that the same cannot be said of the English police. There was an agreement between the two police forces to move forward in an investigation that was seriously considering the possibility that the child died in the apartment, but suddenly the English police veered without consistent technical explanation - as we shall see further. We have always found it odd the way the couple were treated, even after they got their arguido status, and their eventual access to police information. I see the mentally investigation, the memories gush cascaded. I think mainly of this child about to be 4 years old, who all of a sudden was denied the right to existence, to become a woman, to a life of happiness and potential success in the company of her family and her friends, that was abruptly lost. Nothing makes sense. It seems that smothering the facts by decreasing the strength of any clue is being in preparation, forgetting the rights of this child and of others too. But who wants such an outcome ? Who demanded my removal from the operational coordination of the investigation ? Who wants to end the status of the McCanns and Murat as assisted witnesses ? Those who insist on the thesis of the kidnapping ? Those who claimed, and later I will say who they are, that people were arrested for much less in England ? Or those who persist in lying, forgetting the search for the material truth ? The possible shelving of the investigation and the end of the searches certainly favour someone. After leaving Portimao, October 2, 2007, I decided to forget this case. It was perhaps better, given the powers that seemed to be involved. At Portimao I meet Chief Inspector Tavares de Almeida, who was part of the team which I coordinated. We have known each other since we entered the PJ. The words of the national director worry him, he speaks of an investigation request, already filed with the national director of the PJ. He says the investigation of our work will restore the truth. During the five months investigation, we heard a little of everything , but we have done our job. We remember what we have done, the efforts and, honestly, we are not sure that others could have done better. This is not self-sufficiency, it is confidence in the rigour of the work of all police officers involved. - Look ! These people (24), do they know how to sum things up ? How can one speak of precipitation when the McCann became assisted witnesses four months after the facts ? Do not they know the principle of non-self-incrimination ? He was referring to the legal prohibition to take the testimony of a person as a witness (26) to the point where that person might let know facts that would eventually incriminate them. In other words, when someone is about to make statements on a specific case and when, at some point, it appears that this person might be involved or responsible for the practice of an unlawful act, this person has to be made arguido (a). So are preserved the rights and duties of citizens. Curiously, and contrary to what we see very often in the press, especially in the English media, the arguido status protects the (by lawyer) assisted witnesses, since they can keep silent and thus avoid making false statements - as in the case of a simple witness. - I agree with you. If errors were made in this investigation, the delay in changing the status of the McCanns is one of them. There was too much politics and not enough police. - Maybe the national director thinks that the McCanns left the Algarve because of the arguido status. - They stayed in the Algarve as long as the abduction thesis was up-to-datexc ... When this thesis was questioned , they immediately started talking about returning to England. - Hence we can conclude that the arguido status was only a pretext to abandon the country. - You know, there are British journalists who believed that Portugal was a country of the third world ... I did not agree and I have not changed my mind, however only in countries of the third world the head of a ongoing criminal investigation is removed whereas he was not implicated by the investigation that he led. - There are always valid and legal elements ... Finally. The only obstacle to the management of the investigation, almost political ... are the senior leaders of the police forces. - My friend ... People do not direct the police forces for personal interest ... They lead in the pursuit of the public interest. This is the only way to understand the role of the police in a democratic State of law. - But think a little! We can get to the point where only officers agreed by the arguidos will be in charge of some investigations ... It could be a question of 'modernity ' . Fraud or breach of trust ? Reached this point, it is important to make a deductive synthesis of this case. In other words, reject what is false ; discard what you cannot prove for lack of sufficient evidence ; indicate as valid and established what was proven . 2. Within the group, only the parents claim to have seen open the window in the missing child's bedroom ; most ( travelling companions ) cannot reliably testify on this point, as they ran towards the apartment only after Kate McCann launched the alarm. 3. The only independent statement mentioning the open window and shutters was made by one of the Ocean Club nannies, Amy, who arrived at 22:20/30, pretty after the alert, turning hence her statement of no use for the crime time topic. 4. All statements and testimonies reveal numerous inaccuracies, incongruities and contradictions - some could even be described as false testimony. In particular the key-testimony for the abduction thesis, that of Jane Tanner, loses all credibility due to constant evolution which makes it ambiguous and disqualified . 31. 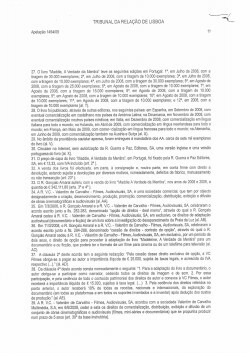 The cover price of the book Maddie - the Truth of the Lie in Portugal was determined by the defendant Guerra&amp;Paz on the amount of 13.33 € VAT included (art. 2º). 47. At least two million and two hundred thousand people watched the program broadcast on TVI 13.04.2009. (art. 10°). CdM : As the case investigator, what is your thesis? GA : The little girl died in the apartment. Everything is in the book, which is faithful to the investigation until September (2007). It reflects the understanding of the Portuguese and English police forces and of the Public Ministry. For all of us, until then, the concealment of the cadaver, the simulation of abduction and the exposure or abandonment were proved. CdM : What led you to indict the McCanns over all of those crimes? GA : It all started with the parents' pressure to an abduction theory. And the abduction is based on two facts: one is Jane Tanner's testimony that says she saw a man passing in front of the apartment, carrying a child (on his arms); the other is the bedroom window, which, according to Kate, was open when it should have been closed. It was proved that none of that happened. CdM : How did you prove that ? GA : Jane Tanner is not credible: she identifies and recognises different people. She starts with Murat, then someone else is mentioned, according to the drawing done by a witness, and she says that is that person, somebody completely different from Robert Murat. CdM : Did Jane Tanner's testimony point towards the abduction thesis ? GA : In order to follow that direction, it would have been necessary to give her credit: there was no other abduction clue. And the window of the bedroom where Maddie and her siblings slept is a vital issue. It leads to simulation. In other words, was it open or not when Jane says she saw the man carrying the child? The little girl’s mother, Kate, is the only person that mentions the open window. CdM : Does this deconstruct the abduction thesis ? CdM : Do Kate’s fingerprints reinforce the simulation theory? CdM : What do you think happened to the body? GA : Everything indicated that the body, after having been at a certain location, was moved into another location by car, some twenty days later. With the residues that were found inside the car, the little girl had to have been transported inside it. CdM : How can you state that? GA : Due to the type of fluid, we policemen, experts, say that the cadaver was frozen or preserved in the cold and when placed into the car boot, with the heat there was then, part of the ice melted. On a curb, for example, something fell on the boot's right side, above the wheel. It may be said that this is speculation, but it's the only way to explain what happened there. CdM : If the body was hidden in the beach area first, was it always out of reach for the searches? 3. Under art. 635-4 (30) and 639-1 (31) of the CPC, the matter of the appeal is delimited by the appellant’s conclusions. The question subject to decision is essentially centred on the evaluation of the alleged illicit act and the 1st defendant’s (here appellant) responsibility ensuing from it in the publication, by the 2nd and the 3rd defendants, here equally appellants, of the works at stake. In terms of personality rights (32), article 26-1 (33) of the CRP states that the rights to a person’s good name and reputation are recognised, as well as protection of the intimacy of private and family life.. The same fundamental law protects with equal dignity freedom of expression, stating in article 37-1 (1) that everyone has the right to freely express and disclose their thought through speech, via image or by any other means, as well as the right to inform, to look for information and to be informed without hindrance or discrimination. Freedom of the press is established under article 38-2, (2) concerning freedom of expression and creativity for journalists and collaborators. Article 18-2 (34) establishes, in the event of a conflict between fundamental rights, that legal restrictions on these rights are limited to the need of preserving other constitutionally protected rights or interests. For its part, the ordinary law enshrines in article 70 of the CC (14), as a principle, that the law protects individuals against unlawful offence or threat of offence to their physical or moral integrity, while according to article 80 of the CC (3) everyone must maintain discretion about someone else’s intimacy of private life. One of the limitations to freedom of information, which therefore is not an absolute right, is the preservation of the right to a good name. Journalists, media, are bound by ethical, professional duties, rigour and objectivity. It is up to the media's right, social function, to broadcast news and express opinions, critical or not, the iimportance being that they do so with respect for the truth and the intangible rights of others, as personality rights . The right to honour, in a broader sense, and the right to freedom of press and opinion are traditional occasions of conflict. Criticism is limited by the rights of the targeted person, but does not stop being legitimate when it is trenchant and sharp but not offensive, because that is often the style of writers. 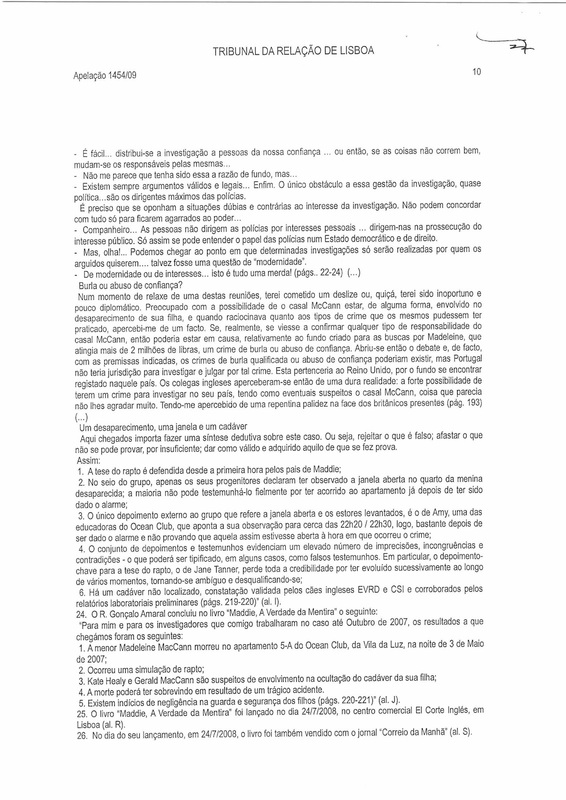 In the case before us, besides the reporting of the facts that are part of the investigation into the disappearance of the minor Madeleine McCann, the analysis of the book and other published matter shows that the now first appellant sustains the thesis that there was no kidnapping, but accidental death of the child, followed by a cover-up - concealment of the body and kidnapping simulation – by the applicants Gerald and Kate McCann, now the respondent party . It results from the above-mentioned publication that evidence elements and clues it reports to are essentially those referred and documented in the respective criminal investigation. 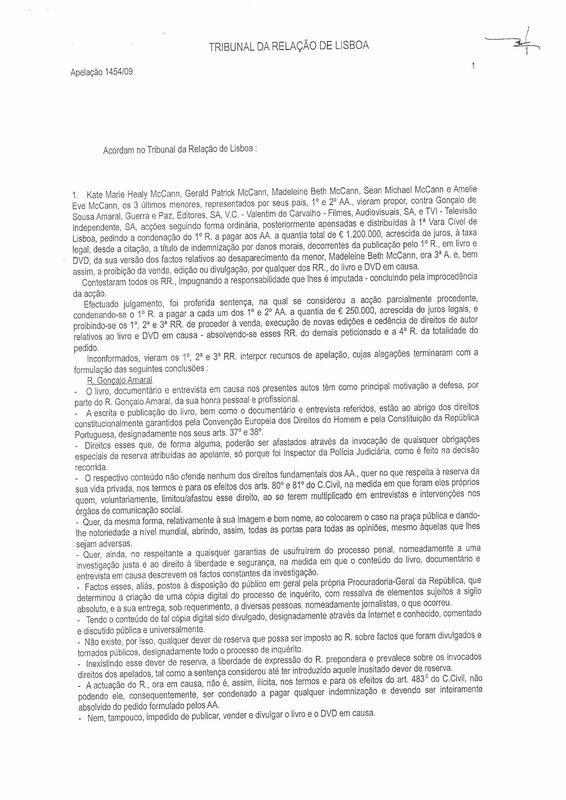 Notwithstanding, the exposed thesis, according to which the minor died accidentally and the parents hid the fact, spreading the kidnapping hypothesis in order to deceive, is not new, since it is also in the report referred to at n° 9 of the proven facts, having determined the constitution of the respondent party as arguidos and having been made public by the media after the digitalisation of the investigation files was provided ( n°s 65 and 66 of the proven facts) . As determined by the appeal ruling heard in this section regarding the appended injunction, the first appellant intended through (his book) to outline his vision of the facts, once the institution to which he belonged (the PJ) did not allow him, as a professional police officer in a criminal investigation, to respond to attacks against its expertise and honour. We must therefore consider the publication of the book as reflecting legitimately the practice of the right to opinion. And it results from what has been proven that, besides the facts at stake were abundantly engraved in the investigation and even made public at the instigation of the Republic Attorney General, the respondents are the ones who, taking advantage of an easy access, multiplied interviews and interventions in the national and international media, so that the conclusion is they themselves voluntarily limited their rights to discretion and intimacy of private life. By this kind of proceeding, they opened the way for anyone to equally express their opinion on the case, contradicting their theory – exercising, doing so, a legitimate and constitutionally sanctioned right to opinion and freedom of expression of their thoughts. 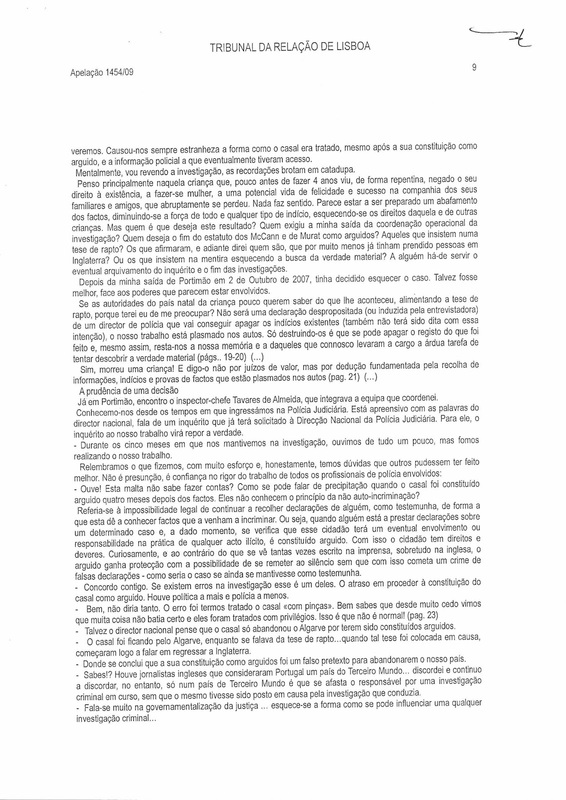 Moreover, we do not see how the right of the respondents to enjoy, after their constitution as arguidos, the guarantees of a criminal trial – including the right to a fair investigation and the right to liberty and security - could be affected by the content of a book that essentially describes and interprets facts that are part of an investigation the contents of which have been made public. Nothing prevents that, although they were not considered sufficient to elicit criminal charges, such facts are subject to various assessments, especially in a literary kind of work. Therefore, and as rights are enshrined namely in articles 37 (1) and 38 (2) of the Constitution, the publication in question has to be considered legitimate. . The appealed decision, however, reckons that the first (here) appellant, Gonçalo Amaral, because he coordinated the criminal investigation into the disappearance of Madeleine McCann until 2/10/2007, remained, even after his retirement on 1/07/2008, subject to the duties of silence and reserve, regularly imposed on officials of the Judicial Police in activity. From what has been said above on this subject, it is clear that the expounded arguments are not worth considering. Indeed, irrespective of the reasons given by the appellant for publication, it is hardly understandable that a civil servant, even more a retired one, should carry on his silence and reserve duties, thus limiting the exercise of his right to opinion as to the interpretation of facts already made public by the judicial authority and widely discussed (actually largely at the instigation of the protagonists themselves) in national and international media. In the absence of the appealed decision's first presupposition, it must be concluded, against it, to the lack of eligibility of any of the respondent party's demands - remaining without effect the re-assessment of the material facts, secondarily requested. Given what has been discussed above, it is judged appropriate, in agreement with both appeals, to revoke the decision on appeal and, considering the action against them unjustified, to acquit the defendants-appellants of all the requests. Costs for both instances are to be paid by the claimants- respondent party. 1. Everyone has the right to freely express and disseminate his thoughts by words, images or by any other means, as well as the right to inform, to seek information and be informed without hindrance or discrimination. 2. The exercise of these rights can not be prevented or restricted by any type or form of censorship. 3. Offences committed in the exercise of these rights are subject to the general principles of criminal law or breach of administrative order, and its appreciation belongs under the law respectively to the courts of law or to independent administrative entities. 4. To all persons, singular or collective, is ensured in conditions of equality and effectiveness, the right of reply and rectification and the right to compensation for damages. c) The right to found newspapers and other publications, regardless of administrative authorisation, deposit or pre-qualification. 3. In general terms, the disclosure of the ownership and funding arrangements of the media organs is required by law. 4. The State shall guarantee the freedom and independence of media from political and economic power by imposing the speciality principle upon companies that own general information media, treating them and supporting them in a non-discriminatory manner and prevent their concentration, in particular through multiple or crossing participations. 5. The State shall guarantee the existence and operation of a public service of radio and television. 6. The structure and functioning of the media in the public sector must safeguard its independence from the Government, the Administration and other public authorities, and to ensure the possibility of expression and confrontation of different currents of opinion. 1. Everyone should keep reserve on the privacy of someone else's life. 2. The reserve extension is defined according to the nature of the event and the condition of the persons. 1. Any voluntary limitation on the exercise of personal rights is null, if it is contrary to the principles of public order. 2. The voluntary limitation, when legal, is always revocable, although with the obligation to compensate the damage caused to the legitimate expectations of the other party. (5) It might be useful to discriminate between "safety" and "security", two different notions that are often mixed up. "Security" refers to all the elements in place to prevent accidental, thus involuntary, events whereas "safety" refers to malicious, thus voluntary acts. For instance the prohibition of using electronic devices when a plane takes off is a security measure, whereas the prohibition of blades on board is a safety one. 1. Any person who , intentionally or recklessly , unlawfully violates the rights of others or any legal provision intended to protect others' interests is obliged to compensate the injured party for damages resulting from the breach. 2. Paying damages, regardless of fault, is only required in the cases specified by law. Who affirms or spreads a fact capable of harming the credit or good name of any person, individual or collective, is liable for damages. 1. If there is a collision of rights, equal or of the same kind, holders should give in to the extent necessary for all right to produce their effects without further detriment to either party. 2. If the rights are unequal or of different kind the one that must be considered superior prevails. a) it does not contain the signature of the judge. b) it does not specify the fundamentals of fact and law that justify the decision. c) the fundamentals are in opposition with the decision or some ambiguity or abstruseness makes the decision unintelligible. d) The judge does not come down for matters that he should appreciate or knows of issues that he could not have taken notice. e) The judge condemns in superior quantity or on different object compared to what has been claimed. f) The determination of responsibility for the costs, in the terms of article 659-4, is omitted. 2. The omission referred to in 1.a) is supplemented unofficially or at the request of either party, when it is possible to collect the signature of the judge who issued the sentence, the judge having to declare in the trial the date on which he signed. 3.When the document is electronically signed, there is no need to make the declaration provided in 2. 4. Nullities mentioned in 1.b) to e) may only be invoked before the Court that issued the judgement if this one admits no ordinary appeal, the appeal being able, otherwise, to have any of these nullities as fundamental. 1 - Well-known facts don't require evidence or allegation, they, facts of general knowledge having to be considered as such. 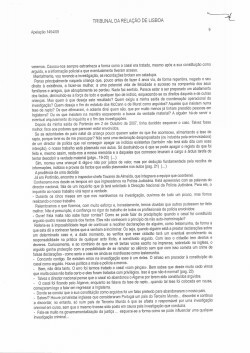 1 - Without prejudice to the following paragraphs, the Civil Procedure Code, approved in annex to this law, is immediately applicable to pending declarative actions. 2. The rules on determining the form of the assessment procedure shall apply only to actions brought after the entry into force of the CPC, approved in annex to this law. 3 - The rules governing the procedural acts of the phase of the pleadings shall not apply to actions pending the entry into force of the CPC, approved in annex to this law. 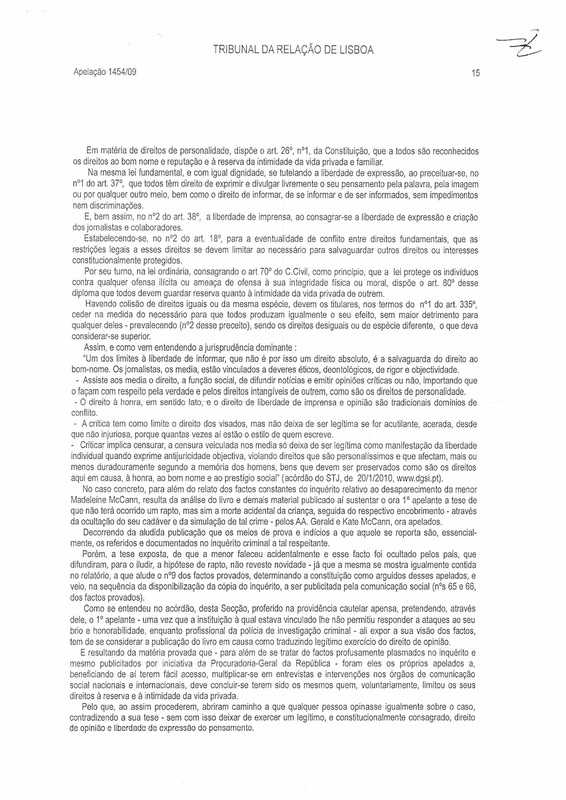 4 - In the actions that, at the date of the entry into force of this law, are in the stage of pleadings, the parties should, completed this stage, be notified to, within 15 days, submit evidentiary requirements or amend those presented, followed by other terms provided for in the CPC, adopted in annex to this law. 5 - In the pending actions in which, at the date of entry into force of this law, the intervention of the collective court has already be allowed, the judgment is made by the court, in the terms at the date of admission. 6 - Until the entry into force of the Judiciary System Organization Act, i circle judge the responsibility for preparation and trial of actions of value greater than the scope of the Appeal Court after the entry into force of the CPC, approved in annex to this law, except in cases where the CPC, approved by dispatch n°. 44,129, of December 28, 1961, excluded the intervention of the collective court. 2. Regardless of liability that may arise , a threatened or offended person may require measures appropriate to the circumstances, in order to prevent the consummation of the threat or to soften the effects of the offense already committed. 1. The officials of the secretariats of the Supreme Court of Justice, the Court of Appeal and any other court can directly perform the acts assigned to them throughout the jurisdiction of the respective court area when it is greater than the area jurisdiction in which the court is inserted. 2 - In the cases provided for in the rules on judicial organization, competence for the practice of secretariat duties may cover the area from other judicial districts. 1. Intellectual, artistic and scientific originality shall not be restricted. 2. This freedom includes the right to originate, produce and disseminate scientific, literary or artistic works, and includes legal protection for copyright. 1. When the need arises to determine whether the facts could have taken place in a certain way , it is admissible to conduct their reconstitution. This is to replicate as closely as possible, the conditions under which the incident occurred or are alleged to have occurred , and to repeat the way they are made . 2. 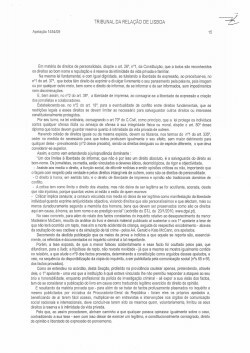 The decree ordering the reconstruction of the facts must contain a brief indication of the objective pursued , the day , time and place will unfold the reconstitution procedure and how it will take place , using possibly to audio - visual means. The Order may appoint an expert for the execution of specific operations . 3. All advertising about this initiative should be avoided wherever possible. (20) The fact that, according to PF, a child, possibly Madeleine, had cried during more than an hour on May 1st night. (21) "Other crimes" here designates "crimes that are not of neglect". (22) This is the preliminary DNA analysis by the FSS of the samples collected in the car hired by the McCanns. (23) It is show off to make believe that things function while they don't. (24) One could imagine that GA is referring to the unfortunate words (the British police was following the MC instead of maintaining a critical distance) that motivated, matter of diplomacy, his dismissal of the case by the national director of the PJ, Alípio Ribeiro, but no, he evokes the suggestion of precipitate arguido status made by the latter to the journalist of the daily Público ( 02/02/2008 ), 4 months later. (26) Please note that the McCanns, from the first day, were "victims" and not "witnesses". Their status has moved from "victim" to "(by lawyer) assisted witness" . (27) GA refers to meetings with British officers, who had come to help the PJ and/or support the McCanns, one of them being Stuart Prior, Detective Superintendent of the Leicestershire Constabulary (now Police), whom GA describes as particularly tense while the interrogations during which the McCanns would be made arguidos were imminent. 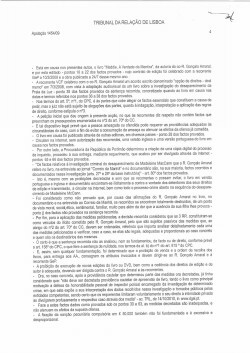 (29) Note that what the claimants did was a reconstruction, and not a reconstitution, quite a different process, previewed and defined in the Portuguese CPC (and more generally performed in any Inquisitorial System), which aims to understand how the event happened. What the Public Ministry requested from the Tapas 9 was a reconstitution, it could by no way use actors, as its purpose wasn't to jog memories as the Common Law (or Adversarial System) reconstruction does. 4. In the conclusions of the allegation, the appellant may restrict, expressly or tacitly, the initial object of the appeal. 1. The appellant shall submit his allegation and conclude, in summary form, by stating the grounds for requesting the amendment or annulment of the decision. (32) "Personality" refers to the individual, i.e the combination of a person's aspects that distinguish them from all individuals of the past, the present and the future. 1. Everyone is recognised as having the right to his or her personal identity, civil capacity, citizenship, good name and reputation, and likeness, the right to speak out and the right to the protection of the privacy of his or her personal and family life. 2. Rights, freedoms and guarantees may be restricted by law in only those cases expressly provided for in this Constitution; restrictions shall be limited to the extent necessary to safeguard other rights or interests protected by this Constitution. This ruling of the Supreme Court of Justice is referred more than one time in this appeal judgement and is worth reading since freedom of opinion and right to good name are involved. A, a journalist, sued B for defamation, demanding a symbolic 1€. B riposted demanding €2.500 plus interests for damages caused by A suing him (B would give the sum to charity). The first instance ruled in favour of B. A appealed and won. B went to the SCJ and lost again. ""Freedom of expression constitutes one of the essential foundations of a democratic society and one of the basic conditions for its progress and the development of everyone. Except for the reserve expressed in par. 2, freedom of expression is applicable not only to 'information' or 'ideas' welcomed with favour or regarded as inoffensive or indifferent, but also to those that aggress, shock or disturb. It is required to be so by pluralism, tolerance and open-mindedness without which there is no 'democratic society'. As stipulated in Article 10, this freedom is subject to exceptions which must, however, be interpreted restrictively, the need for any restriction having to be demonstrated convincingly." "These principles are of particular importance for the press. If this one should not exceed the limits laid down in, inter alia, 'of somebody else's reputation protection', it is its mission to provide information and ideas on political issues and on other topics of general interest. The limits of permissible criticism are wider with regard to a politician, acting in his capacity as a public character, than to a simple citizen."